We were very pleasantly surprised when the well-known GEO magazine came to us by post in February. In the annual edition of Geo Saison editors with the help of 30 professionals in the industry, selected 100 of the best hotels in Europe for 2019, and Chateau Herálec was not missing in the selection. The editors recommended to their reader’s hotel jewels in 10 different categories: the city, the sea, the design, the mountains, the countryside, the wellness, below 100 Euro…. Not only the beauty of the chateau itself was appreciated but also the atmosphere in which we serve our guests, how we connect nature around and offer authentic experiences. It really makes us happy to bring joy to our customers! We would like to thank all of our guest, who inspire us every day and who we really love to serve. Due to your reviews, we again won the Traveller’s Choice Awards for 2019, in four categories! This is one of the most essential awards TripAdvisor puts out and it always makes us happy to be still apart of one of the best and favorite hotels in the Czech Republic. The fact that we continue to be among the best-rated hotels in the Czech Republic is a great recognition for us. Thank you for your support and we greatly appreciate this award! Moreover, we have been the winner of the TripAdvisor Travelers Choice for the sixth year in a row. We received a message from TripAdvisor, which we were very pleased with! Chateau Herálec Boutique Hotel & Spa by L’Occitane was ranked by the world’s largest traveling portal in the Hall of Fame, which caused us to earn a Certificate of Excellence five years in a row. We thank our guests who inspire us and for who we try to make a friendly and family atmosphere at the hotel. We believe that this is why we became the most popular luxury hotel in the Czech Republic in 2018. Chateau Heralec ***** Boutique Hotel & Spa by L’OCCITANE was the only one in the Czech Republic to be among the Top fifteen Chateau hotels in the world! The American news server, CNN Travel, has compiled a ranking of noble hotels from around the world, and we were not missing! Having won a new prestigious award and being a world jewel company with excellent service and access to our guests is a great recognition for us and a huge commitment to the future. That’s why we’re honored to receive the award and we’ll continue to take care of our guests as best we can. We thank all our guests for their support and support! The prestigious magazine National Geographic Traveler has already printed several articles dealing with Chateau Herálec Boutique Hotel & Spa by L’OCCITANE. At the same time, ranked us in the selection of Best hotels worldwide in the special edition Spa & Wellness Collection 2018 and Luxury Collection 2017 as well as previous 2 years. We have been fond of National Geographic for a long time and we appreciate this award! 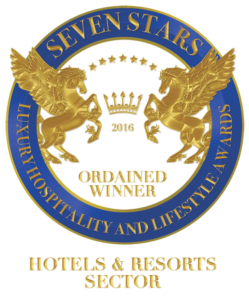 Chateau Heralec Boutique Hotel & Spa by L’OCCITANE has won a prestigious award from the Seven Stars Luxury Hospitality and Lifestyle Awards. We would like to thank our guests for their prestige, which is very pleasing to us. This award is perceived not only as a reward but also as a commitment to the future. Chateau Herálec ***** Boutique Hotel & Spa by L‘OCCITANE was ranked in the TOP 10 castle hotels in the world! The largest travel website TripAdvisor compiled a list of the top 10 castle hotels of the world based on the experiences and recommendations of its users. To our great surprise and pleasure, we ranked 8th! We are thrilled to have received such an award and this way like to thank all of our guests that made this possible with their kind words and appreciation. We are proud that our chateau restaurant Honoria was included in the prestigious Prague Cuisine guide, which is a path of knowledge and a collection of the best dining experiences in Prague. Although Chateau Herálec is an hour away from Prague, it did not go unnoticed and was included among these unique gastronomic treasures. We greatly appreciate the fact that for many people, it is not a problem to drive a few kilometers for good food. With great pleasure, we inform you that Chateau Herálec Boutique Hotel & Spa by L´ OCCITANE obtained the Country Winner award for 2014 in categories Best Luxury Hotel Spa and Luxury Boutique Hotel, for excellent services from the leading world initiative WORLD LUXURY HOTEL AWARDS & WORLD LUXURY SPA AWARDS. Mainly you – our dear guests and also responsible advisers participated in the voting. Therefore our thanks belong to you – our guests who spent relaxed and calm moments in our hotels and thus did not hesitate to give us your vote in such an important world competition. We really appreciate your confidence and we promise we shall continue in hard work on us and our improvement to be able to meet your expectations in the future and even exceed them in some cases.